“Is it possible for someone to hit you real hard and it not to hurt?” asks the baby-doll-faced Louise (Susan Luckey) of her mother Julie Jordon (Shirley Jones). Julie has experienced domestic blisters at the hands of her beloved hubby Billy Bigelow but such is her love for the now deceased scoundrel that the memory of it brings a melancholy smile to her face. Billy (Gordon McRae) died during a bungled mugging and is busy polishing crystal stars somewhere up in a nearby galaxy when he is given the chance to go back down to Earth and try to make amends. And so, through flash backs, the story of the couple’s doomed relationship unfolds, beginning with their first meeting at the fantastic carousel where Billy worked as a barker. It’s an unusual plot for a musical and one that Richard Rodgers and Oscar Hammerstein drew from a play by the Hungarian writer Ferenc Molnar. Liliom had already been adapted for the screen by the legendary German director Fritz Lang when the American song-men got their hands on it and transposed the action from Budapest to Maine. They also changed the ending, so while Liliom ends up in ‘Purgatoire’, Billy walks on, and on with hope in his heart and, as the most famous song in the show goes, will never walk alone. 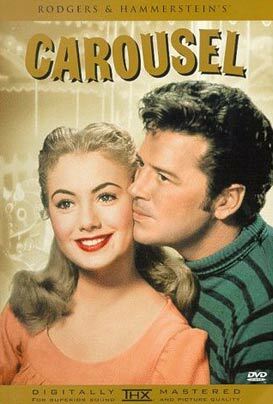 Released just one year after the duo’s smash hit Oaklahoma!, and featuring the same two stars, Carousel looked set to be a triumph. However it had great difficulty at the box office. Perhaps if Frank Sinatra had played the lead as originally intended it might have had more luck. As it is, the film labours under its moral imperative. Still, it’s hard to resist the good old fashioned clam bake re-enacted in the story’s centre, and the many full-blown theatrical dance numbers that lift the spirit no matter how jaded.